Lenzie try to get to grips with a Cumbernauld opponent during Saturday's clash at Auchenkilns. There were mixed fortunes for local rugby sides Allan Glen’s and Lenzie in their BT West League matches on Saturday. Glen’s made it six Division 1 wins out of six with a 33-17 win at Cambuslang. 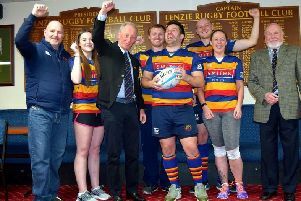 But there was disappointment for Lenzie who went down 13-10 at Cumbernauld in a Division 2 derby clash. At Cambuslang Glen’s thought they were in for an easy win on Saturday when they found themselves two tries up after only 10 minutes. The first was a superb pack effort driving over the hosts’ line and Lennon being credited with the touch down. The second followed a good inter-passing move by the backs with Mooney finishing off the move to score. Cambuslang rallied somewhat but couldn’t really match the pace and skill of the visiting backs. And Reilly scored for Glen’s after another attack by their backs, giving the visitors a cushion of 15 points. However just before half -time a careless pass by Glen’s allowed Senter to intercept and sprint to the visitors’ line. He then converted his own try to make the half-time score 15-7. The restart saw a flurry of penalties as the tension beset both sides, one for Cambuslang by Senter and two for Glen’s by Thomson. A backs try for Glen’s followed after a break by McKeown allowed Lennon to breach the home defence, Thomson converting. But five minutes later Morrison skipped through to score during a lapse in concentration by the visitors’ defence. Senter converted. A final excellent try for Glen’s involving Murrell, Henderson and touched by Frame ended the day’s scoring. It was a somewhat scrappy game overall but a lot of good rugby was played by both sides. Glen’s, two points clear of Garnock at the top of the table, will go for win number seven when they host Carrick this Saturday. Meanwhile Lenzie were disappointed to lose to a determined home side in a tight game at Cumbernauld. Lenzie were in control of the first half and scored good tries by Bryson and McCrae with Brodie missing both conversions for Lenzie to lead 10-3 at the break. The second period began well for the home side as they retained possession and put Lenzie’s forwards under pressure to win a penalty to reduce their deficit to 10-6. The game then entered a bizarre period when the referee awarded a surprising penalty try to Cumbernauld, gave a number of strange decisions to both sides and disallowed an excellent Lowrie try for the visitors. Lenzie finished strongly, but Brodie’s kicking was poor as he missed another penalty in front of the posts and despite sustained pressure Lenzie failed to achieve the try they needed. Best for Lenzie were Bryson, McKenzie and Haddow with C Mortimer being the player of the day. This Saturday Lenzie host Strathaven.